Police officers in Nevada may soon have a new piece of equipment that they are required to clip on after a measure regarding body cameras was sent to Gov. Brian Sandoval for his signature Thursday. According to Reuters, the proposal, which has already been approved by the state Legislature, would make Nevada the second state in the United States to require that state and local police use bodycams while doing their jobs. North Carolina passed a similar requirement in 2015. 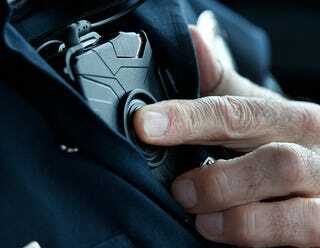 “Providing every officer with a body camera protects officers while they’re on the job and engenders trust among the public,” state Sen. Aaron Ford, the bill’s sponsor, told Reuters Thursday. The bodycam requirement broadens existing state rules and would require their use by the Nevada Highway Patrol and also require that the devices be activated anytime police investigate a crime or stop a citizen. Holly Welborn, policy director for the Nevada American Civil Liberties Union, noted that while the ACLU had expressed concerns over previous versions of the bill because of privacy and transparency issues, the organization was in full support of this year’s version after safeguards were strengthened, Reuters notes.